Dr. Edwin James wrote down the stories John Tanner told about his life. Tanner was kidnapped in Kentucky by Ojibwes at the age of nine and then sold to an Ottawa woman who brought him to Red River. His native name is Shaw-shaw-wabe-nase, and in English they would call him "The Falcon." 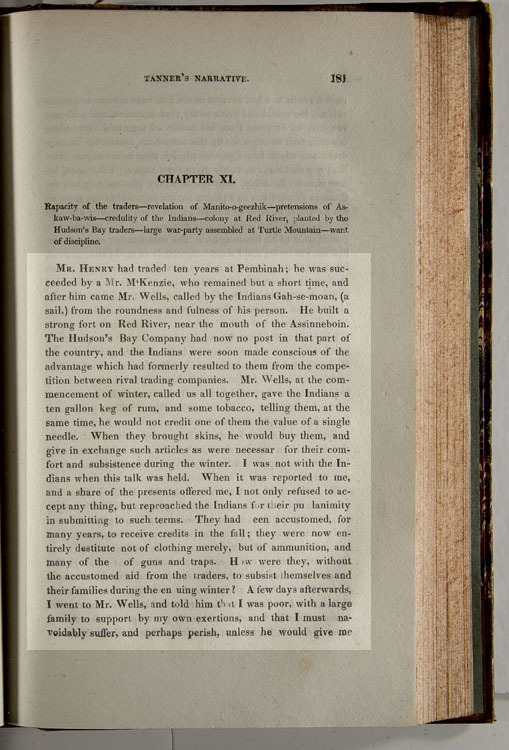 Beginning on page 181 ["Mr. Henry had traded..."] and going through to page 184 ["... on the other side. "], Tanner describes his dealings with an unscrupulous North West Company post manager who won't give credit to Tanner or his fellow natives to help them survive the upcoming winter while they trap furs for him. Instead, Tanner makes a deal with an HBC man new in the area, but in spring when he brings the furs into town to pay off his HBC credit line, the North West manager tries to steal Tanner's furs at gunpoint. “Mr. Henry had traded ten years at Pembinah; he was succeeded by a Mr. McKenzie, who remained but a short time, and after him came Mr. Wells, called by the Indians Gah-se-moan, (a sail,) from the roundness and fullness of his person. He built a strong fort on Red River, near the mouth of the Assinneboin. The Hudson’s Bay Company had now no post in that part of the country, and the Indians were soon made conscious of the advantage which had formerly resulted to them from the competition between rival trading companies. Mr. Wells, at the commencement of winter, called us all together, gave the Indians a ten gallon keg of rum, and some tobacco, telling them, at the same time, he would not credit one of them the value of a single needle. When they brought skins, he would buy them, and give in exchange such articles as were necessary for their comfort and subsistence during the winter. I was not with the Indians when this talk was held. When it was reported to me, and a share of the presents offered me, I not only refused to accept any thing, but reproached the Indians for their pu lanimity in submitting to such terms. They had been accustomed, for many years, to receive credits in the fall; they were now entirely destitute not of clothing merely, but of ammunition, and many of the ----- of guns and traps. How were they, without the accustomed aid from the traders, to subsist themselves and their families during the ensuing winter? A few days afterwards, I went to Mr. Wells, and told him that I was poor, with a large family to support by my own exertions, and that I must unavoidably suffer, and perhaps perish, unless he would give me such a credit as I had always, in the fall, been accustomed to receive. He would not listen to my representation, and told me, roughly, to be gone from his house. I then took eight silver beavers, such as are worn by the women, as ornaments on their dress, and which I had purchased the year before at just twice the price that was commonly given for a capote; I laid them before him, on the table, and asked him to give me a capote for them, or retain them as a pledge for the payment of the price of the garment, as soon as I could procure the peltries. He took up the ornaments, threw them in my face, and told me never to come inside of his house again. The cold weather of the winter had not yet set in, and I went immediately to my hunting ground, killed a number of moose, and set my wife to make the skins into such garments as were best adapted to the winter season, and which I now saw we should be compelled to substitute for the blankets and woollen clothes we had been accustomed to receive from the traders. I continued my hunting with good success, but the winter had not half passed, when I heard that Mr. Hanie, a trader for the Hudson’s Bay people, had arrived at Pembinah. I went immediately to him, and he gave me all the credit I asked, which was to the amount of seventy skins. Then I went to Muskrat River, where I hunted the remainder of the winter, killing great numbers of martens, beavers, otters, etc. Early in the spring, I sent word by some Indians to Mr. Hanie, that I would go down to the mouth of the Assinneboin, and meet him there, to pay my credit, as I had skins more than enough for this purpose. When I arrived at the Assinneboin, Mr. Hanie had not yet passed, and I stopped to wait for him opposite Mr. Well’s trading house. An old Frenchman offered me a lodging in his house, and I went in and deposited my peltries under the place he gave me to sleep in. Mr. Wells, having heard of my arrival, sent three times, urging me to come and see him. At last, I yielded to the solicitations of my brother-in-law, and crossed over with him. Mr. Wells was glad to see me, and treated me with much politeness; he offered me wine and provisions, and whatever his house afforded. I had taken nothing except a little tobacco, when I saw his Frenchman come in with my packs. They carried them past me into Mr. Well’s bed room; he then locked the door, and took out the key. Immediately his kindness and attentions to me relaxed. I said nothing, but felt not the less anxious and uneasy, as I was very unwilling to be deprived of the means of paying Mr. Hanie his credit, still more so to have my property taken from me by violence, or without my own consent. I watched about the house, and at length found an opportunity to slip into the bed room, while Mr. Wells was then taking something from a trunk. He tried to drive me, and afterwards to push me out, but I was too strong for him. After he proceeded to this violence, I did not hesitate to take up my packs, but he snatched them from me. Again I seized them, and in the struggle that ensued, the thongs that bound them were broken, and the skins strewed about the floor. As I went to gather them up, he drew a pistol, cocked it, and presented it to my breast. For a moment I stood motionless, thinking he would certainly kill me, as I saw he was much enraged; then I seized his hand, and turned it aside, at the same moment drawing from my belt a large knife, which I grasped firmly in my right hand, still holding him by my left. Seeing himself thus suddenly and entirely in my power, he called first for his wife, then for his interpreter, and told them to put me out of the house. To this, the interpreter answered, “You are as able to put him out as I am.” Some of the Frenchmen were also in the house, but they refused to give him any assistance. Finding he was not likely to intimidate or overcome me by violence, he had recourse once more to milder measures. He offered to divide with me, and to allow me to retain half my peltries for the Hudson’s Bay people. “You have always,” said he, “belonged to the north west; why should you now desert us for the Hudson’s Bay!” He then proceeded to count the skins, dividing them into two parcels; but I told him it was unnecessary, as I was determined he should not have one of them. It was customary to give a gift of tobacco when making new acquaintances or conducting business. Minnedosa, Manitoba used to be called Tanner's Crossing, in honour of John Tanner. He was the first settler, and responsible for building a store and post office for the area. The town grew as a result of the Red River cart brigades stopping there to cross the Little Saskatchewan River as they made their way to Edmonton.